Riviera Nayarit Mexico Blog: Independence Day Promos Have Arrived at the Riviera Nayarit! Independence Day Promos Have Arrived at the Riviera Nayarit! With the new ¡Viva México! Promotions, Mexico’s Pacific Treasure and its associated hotels want to make giving the Mexican Independence Day grito, or “yell,” as fun as possible this September 15th. 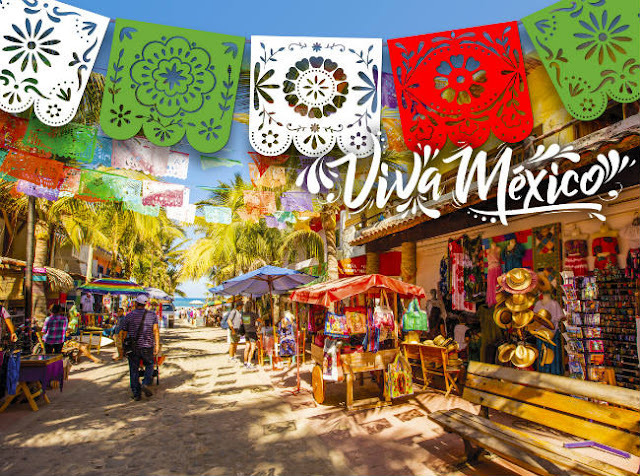 The Riviera Nayarit invites domestic and international tourists to celebrate the country’s Independence Day and a weekend filled with the most Mexican of festivities with their latest promotions titled ¡Viva México! These seasonal offers are generally launched when the summer season is over, thanks to the work of the Riviera Nayarit Convention and Visitors Bureau together with the Bahía de Banderas Hotel and Motel Association. It’s a way of maintaining the excellent occupation rates and the influx of travelers to the destination after the vacation period. This year there are 30 participating hotels from Nuevo Vallarta, Punta de Mita, La Cruz de Huanacaxtle, Bucerías and Rincón de Guayabitos, which will keep their promotions open from September 1 – 22, 2017. Top promotions include 15 to 55% discounts on rack rates; pay your trip in 3 to 6 months without interest; up to three kids free per room or 50% discount on children under 12; 1 tour per person per stay; tennis clinics; free Internet; accessories for beach, pool or bath; welcome basket; free parking; free rounds of golf; premium beverages; and spa, resort, golf or boutique credits. The hotels have also programmed interesting events during that weekend with the full Mexican experience, including tequila, mariachi bands, dancing and plenty of fun, so everyone can have the chance to enjoy the celebration. In Nuevo Vallarta and Flamingos: Bel Air Collection Resort & Spa Vallarta, Dreams Villamagna Nuevo Vallarta, Grand Velas Riviera Nayarit All Inclusive Resort, Hard Rock Hotel Vallarta, Hotel Las Palomas Nuevo Vallarta, Marina Banderas Suites, Marival Residences, Marival Resort & Suites All Inclusive Riviera Nayarit, Ocean Breeze Hotel Nuevo Vallarta, Paradise Village Beach Resort, Riu Jalisco, Riu Palace Pacífico, Riu Vallarta, Samba Vallarta All Inclusive Beach Resort by Emporio Hotel's, Villa del Palmar Flamingos Beach Resort & Spa, Villa La Estancia Luxury Beach Resort & Spa Riviera Nayarit, Villa Varadero Hotel and Suites. La Cruz de Huanacaxtle: B Nayar, Grand Sirenis Matlali Hills Resort & Spa | Punta de Mita: Grand Palladium Vallarta Resort & Spa - All Inclusive, Iberostar Playa Mita, Imanta Resort Punta de Mita, Rancho Banderas All Suites Resort By Marival, The St. Regis Punta Mita Resort | Bucerías: Refugio del Mar, Royal Decameron Complex, Vista Vallarta All Suites on the Beach | Rincón de Guayabitos: Decameron Los Cocos. You can also make your reservations at participating hotels.